Yes, you've read right. 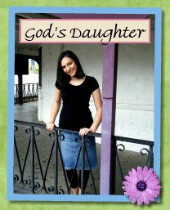 I've been featured by my lovely dear bloggy friend Miss Raquel over at her blog, God's Daughter. So, if you all want to head on over to Raquel's blog to check out my interview please go right on ahead and do so. Don't forget to check out Miss Raquel's lovely blog too while you're there! The link can be found below.